When I first became a Christian, I discovered relationships and my personal comfort were my biggest idols. My prayers were fear-filled plea bargains. I’ll follow You, trust You, obey You, Lord, but please, please, please have mercy. I can’t bear the thought of losing (fill in the blank). As I think back on my whining-prayers, I realize I wasn’t prepared for the cost of discipleship. I still placed God below and behind the things and people of this world. Even my emotions became idols. I didn’t want to face fear, grief, sickness, pain, or worry, so I coveted easy routes. My selfish cries for favor were poor attempts to sidestep pain and lessen the risk of loss. My pleas for comfort were sad tactics intended to help me avoid giving up what I wanted, what I valued, what I thought I deserved, what I worked hard for, what I called my own and did not want to risk losing. But as I continued to draw nearer to my Savior, He helped me understand that following Him wouldn’t always lead me down easy streets. God gives us all we need to live in fearless faith, walk in freedom, embrace His grace, and follow Him . . . no matter how high the stakes. None of the wonderful things God does in and through our hard days would be possible if we refuse to risk those high stakes, if we deny the Lord because we think we have too much to lose. When God invites us to trust Him, He assures us we’ll face trials and troubles, as well as plenty of persecution and opposition. He also promises He’ll be powerful, patient, and present, as He empowers us to live for Him. But when we believe God, when we’re ready to live brave we’ll face the idols that keep us focused on what we have to lose instead of all God has given us, all He promised us. When the Lord asked Gideon to destroy his father’s idols, He wasn’t just asking him to clean house. Gideon had to rid his life of the fears and insecurities he’d placed on the throne of his heart, before he could follow God with courageous faith. When Gideon doubted and complained about the rough road his people had endured, God didn’t make excuses or apologize. He told Gideon to go with the strength he had, the strength God had given him, and to remember God Himself was sending him so there was no need to fear or fret (Judges 6:14). When Gideon focused on his own feebleness, the Lord didn’t console him or give him a list of all he’d accomplished in the past. He simply assured Gideon that He would be with him (v. 15-16). When Gideon demanded proof of God’s faithfulness (v. 17), depended on his own works by offering a sacrifice God never asked him to give (vv. 18-19), the Lord met Gideon right where he was (v. 20-21). Gideon trembled in the face of God’s might (vv. 22-23), and God’s comfort resulted in Gideon’s outpouring of worship in which he emphasized the peace of God’s presence (v. 24). Bowed before the Lord, Gideon was ready for the biggest step in his pursuit of honoring God. But even in his obedience, the “mighty warrior” still displayed weakness when he chose to act under the cloak of darkness (vv. 25-27). Gideon’s not the last of God’s children to slip into the safety net of life as an undercover, lukewarm, conditional, or compromising believer. Still, despite Gideon’s weak-spots and mess-ups, it seems God used his obedience to influence his father. Joash became Gideon’s supporter. He stood up for his son against the hostile crowd seeking revenge for the destruction of Baal’s alter, declaring false gods have no power (v. 32). And after having seen the One True God in action, Gideon stood against the enemy armies (vv. 33-35). When we’re following the Lord, we’ll often face problems that feel insurmountable or adversaries that seem unbeatable. It’s tempting to cling to idols, which can include our works, talents, abilities, skills, or connections, as if they were more dependable than the God who gave them to us. Insecurities and fear may even become idols that we place before God, idols that tempt us to want to make God prove His faithfulness, to assure us that we won’t have to risk defeat, pain, loss, or anything we might value more than pleasing Him. As lovers of God, we’ll come to realize the great cost of discipleship includes risking great loss and facing high stakes. But we don’t need not be afraid because our unchanging God loves us unconditionally. 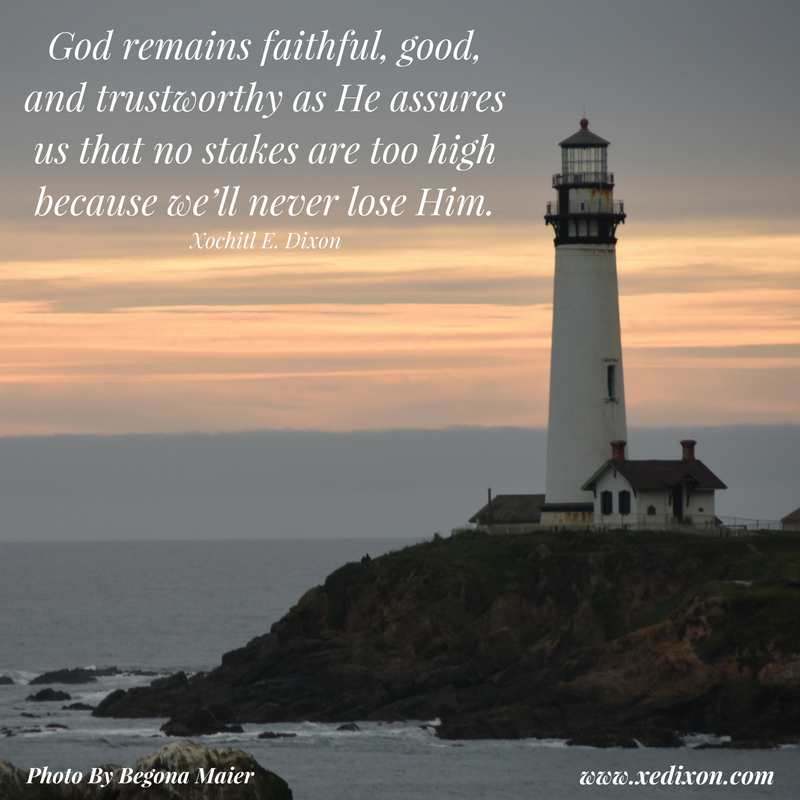 God remains faithful, good, and trustworthy as He assures us that no stakes are too high because we’ll never lose Him. Lord, thanks for assuring us that we don’t need to depend on our own strengths or fear the high stakes of following You. In Jesus’s name, Amen. Photo taken by and used with permission from Begonia Maier. Thanks so much. Have a happy and blessed Sunday. I appreciate your encouragement, Sally. I am glad you’re joining me for the Living Brave, Sister. God is so good! Have a wonderful weekend! Looking forward to this new series. Living Brave is an everyday commitment. I’m excited to be on this journey together, Colleen. To God be the glory, the honor, and the praise! Wonderfully expressed. Even after years and years to following the Lord, I still want to “suggest” to him what I think I can endure for him and what I don’t believe I can. Thankfully, he doesn’t take my advisement while we lovingly guides me through so many of the places I feared the most. You are so not alone in that daily battle, Glenn. I’m glad God doesn’t take my advisement either. Thanks for sharing with such transparency. It’s a blessing to know we are not alone in our struggles as we walk with God one glorious day at a time. Thanks for your encouragement. To God be the glory!